Here's a historical view of the Paddle Steamer Curlip, her origins in the 1880's and the people who realised their dreams of a new life in a remote community. 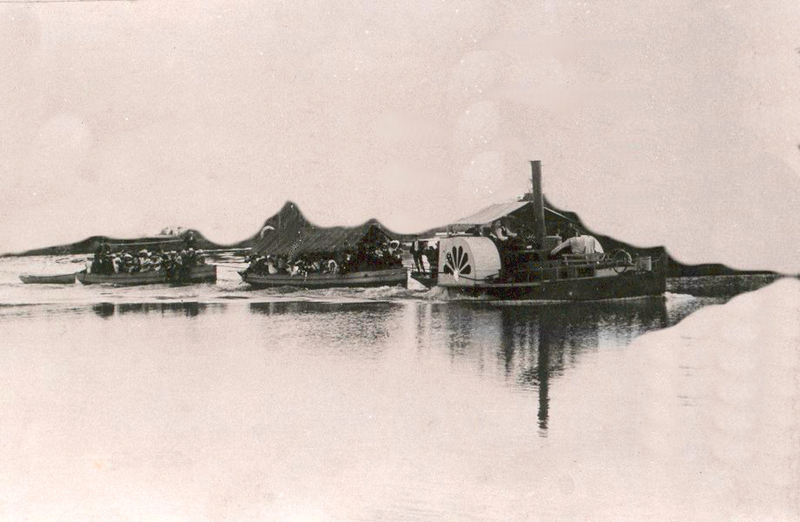 This image was taken, later in the life of Paddle Steamer Curlip, around July / August 1897. She is sporting a new taller funnel, with guy wires attached, her hull colour was painted a darker colour Green, with Copper paint underwater. Frank Richardson is standing on the deck. 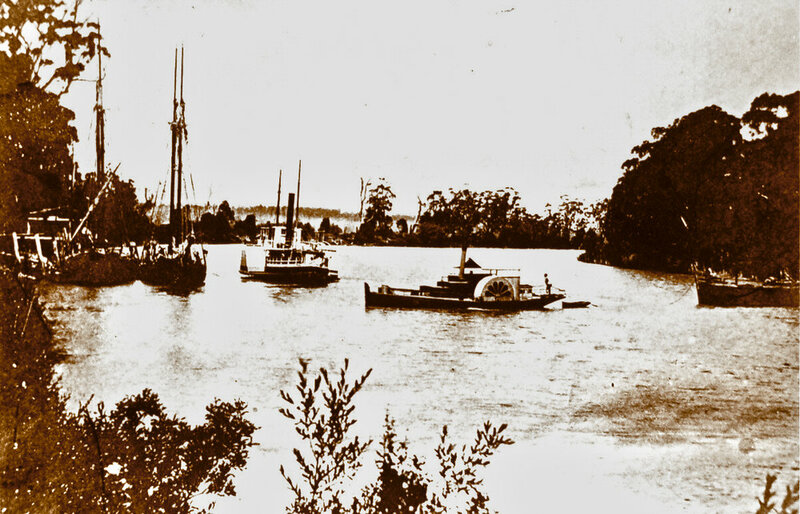 This collection of images, features Paddle Steamer Curlip at work up and down the Snowy River and at the Port of Marlo, the Paddle Steamer Lady of the Lake is featured behind Curlip in one of the images. The cargo on her barges were the lifeblood of the community, maize, chaff, beer supplies were just a few of the supplies. Other common goods transported included, hides and skins, biscuits in tins, cases of kerosene, doors and windows, furniture, flour, galvanised iron and spouting, wire and all the other emerging building materials, vital for remote communities. High AFTERNOON TEA ABOARD P.S.CURLIP ON THE SNOWY RIVER at marlo. 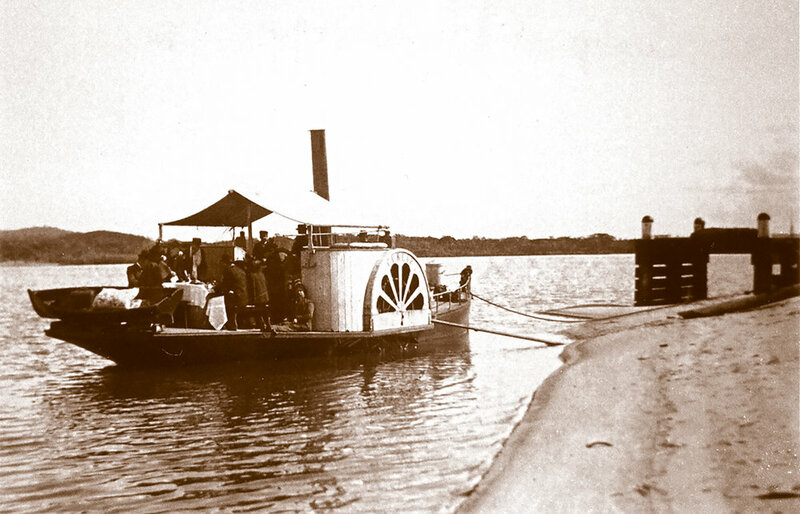 Things were done with a sense of style back in the day... Paddle Steamer Curlip will be providing high afternoon tea aboard in 2017 when she returns to service along the Mitchell River.... some things should never change. 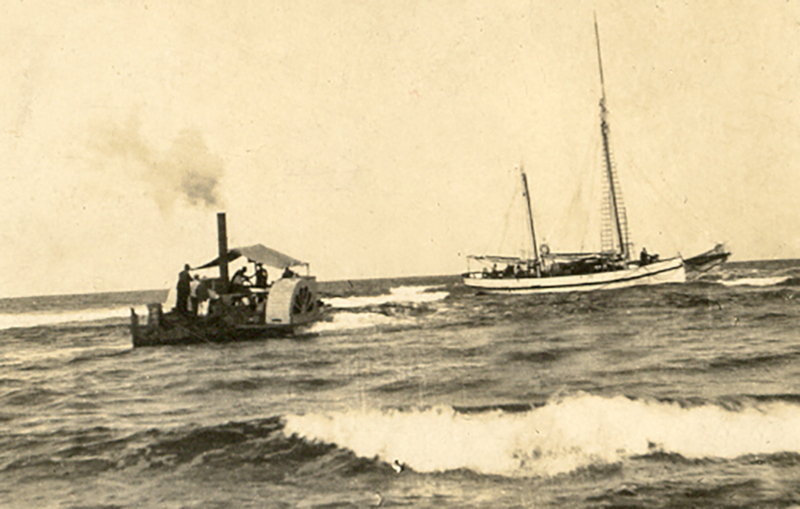 PADDLE STEAMER CURLIP ON THE SLIPS AT TABBARA. Paddle boxes with decorative patterned cut outs are one of the beautiful features of Paddle Steamers of this era. Her elegant hull as previously mentioned was 48ft long, 10ft wide, with a draught of approximately 2ft. Repairs were generally carried out during winter, so that the vessel was ready for work and the big maize hauling season, which began in late August of early September. The original Paddle Steamer Curlip up on the slip for annual maintenance, at the Richardson's slip and timber mill at Tabbara on the Brodribb River. PS Curlip was registered in 1893 and the Passenger Certificate issued on 30th January 1903 to Captain Alan Richardson by the Marine Board of Victoria entitled her to carry 25 passengers and only 10 passengers when engaged in towage service. Two children under 12 years of age to be reckoned as one passenger. PS Curlip, sometimes, towed up to five barges at a time, traveling upstream as far as Bete Bolong, 20 km upstream of the mouth of the Snowy River, to collect produce to be transferred to schooners near Marlo. She towed vessels in and out through the Snowy river entrance and was also used for social functions such as Sunday School picnics. 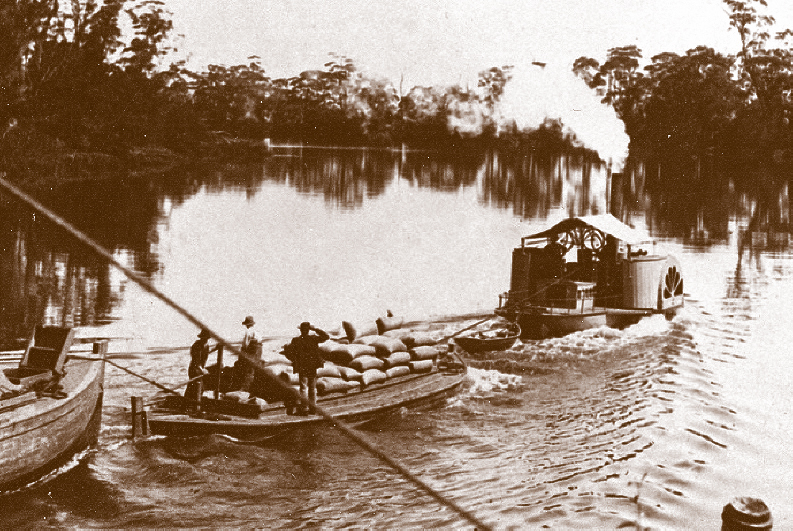 Curlip was the main means of transport for imports and exports on the Snowy River for almost 30 years. 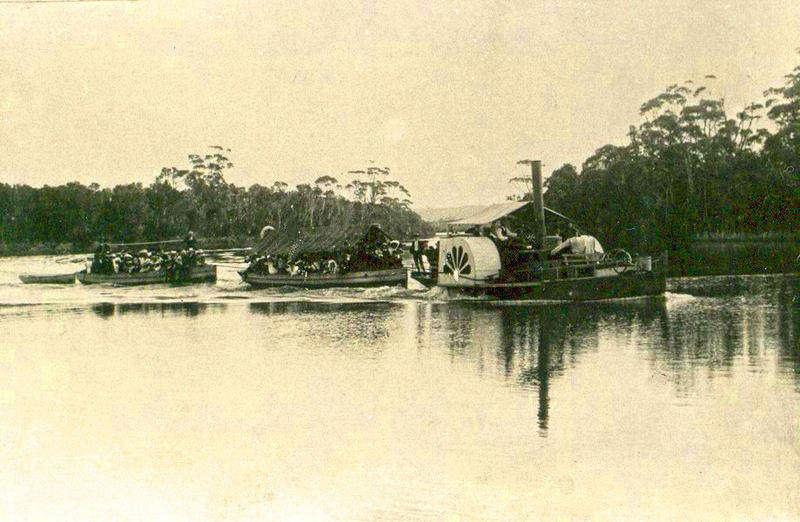 Paddle Steamer Curlip, crossing the Marlo Bar to transfer passengers and goods for the communities of Orbost and Marlo. Contrary to modern opinion Paddle Steamers were very seaworthy and designed to cope with bar crossings and limited coastal ocean work. Their shallow draft was their greatest asset with surface propulsion.